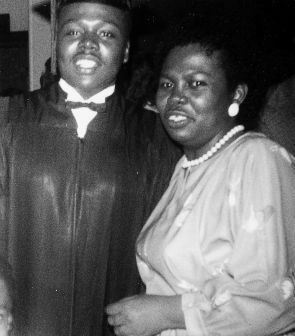 John Fountain and his mother Gwendolyn Marie Hagler Clincy during happier times celebrate his graduation from Wilbur Wright College. CHICAGO--In the cold, I could find no traces of her footprints in the snow. I stared down my block into the darkness of midnight and the snow-laden, frigid streets. My heart pounded. My thoughts seemed frozen. "Ma?" I called out, hoping she was close enough to hear. "Ma-a-a-a?" My breath hung on the icy air. No answer . . . Into the darkness, my mother had disappeared. She slipped from my front door as we slept, just after midnight, wandering away in a haze of Alzheimer's and her heart's hope of at last finding "home." I hadn't long lain across my bed, having first checked in on her. She was sleeping soundly. Mama was diagnosed a few years earlier with Alzheimer's. She was one of the lucky ones. Or, I should say, we were lucky--fortunate--to have accepted Mama's symptoms as an indication that something was wrong. So many African Americans, according to the American Alzheimer's Association, apparently dismiss or ignore the symptoms--at least until it is too late. In fact, according to the Alzheimer's Association, blacks with Alzheimer's represent a growing trend of Americans, and are twice as likely as whites to "develop late-onset Alzheimer's disease" and "less likely to have a diagnosis of their condition, resulting in less time for treatment and planning." In 2015, an estimated 5.3 million Americans have Alzheimer's, according to the Alzheimer's Association, and it is the sixth leading cause of death in the United States. The Association has long identified what it calls an emerging public health crisis among African Americans, dubbed in a 2002 study as the Silent Epidemic of Alzheimer's Disease. That study cites research that that shows high cholesterol and high blood pressure, which disproportionately affect African Americans, as significant risk factors for Alzheimer's. It also predicts that the number of African Americans age 65 and older will have more than doubled, from 2.7 million in 1995 to 6.9 million in 2030, thereby increasing the likely number of those facing Alzheimer's disease. "The epidemic of Alzheimer's will continue to spread over the next 30 years..." the study concludes. The report calls for accelerated research into the disease, specifically as it impacts African Americans; increasing awareness among African Americans so that they may participate in research and also receive treatment and services; and to develop and expand services that are affordable and "culturally appropriate." My family and I relied on the wisdom of the Alzheimer's Association, the leading volunteer health organization in Alzheimer's care, which is worth its weight in gold. It helped us prepare and plan, and to help our mother navigate this often pain-ridden journey of Alzheimer's--even if we could not prevent the inevitable. Even if there are memories of the night Mama disappeared into the cold and snow. Mama's wandering had worsened. She sometimes stayed the weekend with us. I wanted to take care of her, protect her, for what time we had left together. Make her smile. Make sure she ate well, took her meds. Make sure she was safe. Dead tired, I must have drifted off. The telephone rang. It was the security company: "You have a breach at your front door . . . Police are on the way." We ran frantically to where Mama had been sleeping . . .
Sure enough, the front door was closed but unlocked. Mama's shoes and coat were still there. She had left, wearing only socks and pajamas. I dashed out the front door without a coat, my heart racing, fighting back tears, my mind filled with thoughts of my mother freezing to death and dying outside in the cold -- alone. With thoughts of Mama being attacked by someone or some wild animal. Or being run over by a truck on the highway -- just blocks away -- while in the haze that can leave some Alzheimer's sufferers drifting in a trance-like state. When Mama did not answer, I ran to the garage and hopped into my car. As I sped out of the driveway, lights from police squads flashed. "My mother's missing . . ." I told one officer, pausing just long enough. "She has Alzheimer's. I gotta make sure she didn't get to the highway . . . Talk to my wife." I drove to the highway, scanning the snowy streets. But no Mama. I circled back home. But no Mama. I drove around again -- slowly, deliberately. No Mama. The police searched and searched, but still no sign of Mama. With time and cold drifting on the wind, the officers called for the canine unit. The dog arrived. An officer gave him my mother's scarf and he set out immediately, tracking her scent. I set out again in my car, combing the dark . . .
That night was to be a lesson in the cold. The cold of winter. The cold of life that can steal our memories, leave us lying frozen in misery, unless we remember: To be thankful. To inhale each moment. To cherish good memories with our loved ones and to make as many of them as we can. And to know that even that which cannot be remembered with the mind is never completely lost. But forever planted deeply in the heart -- permanently seared into the soul. I was still searching when my cellphone rang. They found Mama. Half a mile away, she was cold and confused, but safe. We warmed her feet and fixed her a cup of hot tea. Eventually, we went back to bed -- thankful for the kind police officers and a police dog named Lars. Thankful for a lesson in the cold. A lesson I will warmly embrace for as long as I live, especially because Mama is no longer here. Except I know that she always will be, even without seeing her footprints in the snow. Author's Note: My mother Gwendolyn Marie Hagler Clincy ended her battle against Alzheimer's, succumbing to cancer on Aug. 22, 2014. She was 71. 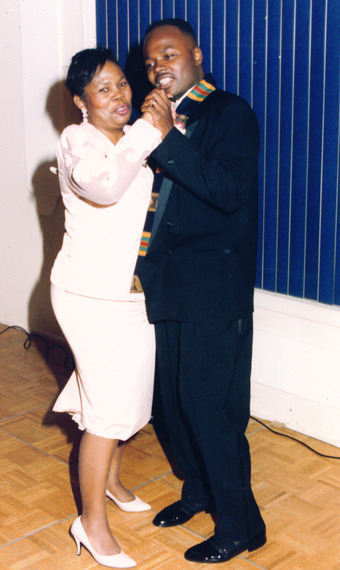 Fountain and his mother celebrate in happier times, dancing at his wedding in 1992.